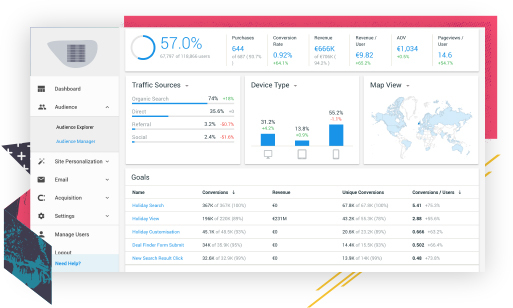 Collect behavioral and intent data from your web, app, and third-party sources and use it to deliver a cohesive personalized experience across channels, even for anonymous visitors. Create a single source of truth for the myriad of interactions your travel customers have with each touchpoint, based on data from all available sources. Integrate multiple technologies for personalization, messaging, and experimentation into one unified platform. Manage, sustain, and grow your personalization program without dependency on dedicated development or creative resources. Delivering a great customer experience requires an integrated data collection system. With Dynamic Yield, you can identify and create new segments based on any data point to build ideal customer profiles. Drive higher revenue and competitive differentiation by personalizing your travel consumers’ experiences based on previous trips with your brand, real-time behavior, CRM data, and more. Dynamically optimize the layout, design and content of your site, app and emails. Remove friction in the booking flow, perfect the mobile experience, optimize the navigation, and more. Influence your travel consumers' behavior through targeted overlays and notifications. Encourage faster conversions with scarcity and social proof messages, boost upsells, and deepen customer loyalty. Reach the right customers at the right time by targeting specific traveler consumers who have abandoned your site with triggered emails and personalized push notifications. Get answers to the most frequently asked questions about scaling personalization and discover perspectives from practitioners on the current and future states of personalization. Assess your ability to deliver superior customer experiences and benchmark your results with others in the travel industry. How businesses can use anonymous visitor tracking to identify the intent and preferences of "unknown users" in order to personalize experiences that drive action.